Barry Kleinpeter – He may be a freshman, but Kleinpeter has guided the Hornets to a 7-3 record and a playoff appearance. The freshman was efficient against Treutlen last Friday, passing for 164 yards and two scores. If the Hornets are going to make a run in the Class A Private playoffs, Kleinpeter will need to come up big. Eric Phoenix – The 6’3 southpaw has guided his Knights to the state playoffs with both his left arm and his feet. Phoenix wrapped up his senior regular season with 1,746 yards passing and 16 touchdowns, as well as 813 yards on the ground and 9 touchdowns. The Knights have a solid D, but it will have to be Phoenix to lead the Knights past an extremely tough first round matchup at undefeated Pierce County. John Jones – The Bears just wrapped up a perfect regular season and and senior RB/FS John Jones was a massive part of that. Robbie Ross, host of “The Bear Cave” on ESPN Radio Coastal Georgia and ESPN Radio Okefenokee, had this to say on Jones, “John Jones showed the heart that this year’s Pierce County team has last Friday night. Sick all week long, last week, with flu like symptoms, wasn’t known if he would play until game time, and pushes forward for 209 yards on 27 carries and 4 touchdowns to lead the Bears to the comeback region title game win.”. Big things are expected of Pierce this year, and Jones is one of the reasons why. Jakeen Harris – Coach Danny Britt has made a concerted effort all year to limit Harris’ snaps, as much as he could, on the offensive side of the ball. Harris, of course, is a 3-star safety committed to play at NC State next year. Obviously, during the regular season, you want want perhaps your best defensive player to play defense, but Harris has undeniable athletic ability that translates to the offensive side of the ball. The Cadets have talent all over their offense, but expect Harris to see an uptick of touches on offense, especially later in the playoffs. Blaize Minick – The senior quarterback guided the Jackets to a 9-1 regular season and number 2 seed in the state playoffs. An experienced dual-threat quarterback, Minick will need to continue his good play if the Jackets are going to make some noise. Kris Coleman – He may be undersized at 5’7 153 pounds, but Kris Coleman is the biggest part of the Panther offense. Go all the way back to week one when Coleman ripped off 351 yards on the ground and tacked on 5 touchdowns against Bradwell Institute. There are a bunch of running backs in the state that don’t have those numbers on the year. Liberty finished the regular season 7-3 and now must face 9-1 SE Bulloch on the road. If Coleman can get his, the Panthers will be in every game. Wanya Pringle – Much has been made about the Jenkins offense, but it was the defense who almost pulled the upset over Benedictine for the region championship. The undisputed leader of that defense? Wanya Pringle. Slightly undersized for an inside linebacker, Pringle makes up for it with raw tenacity and leadership. The senior will come it and thump at the line, and plays well in coverage. Expect this defense to be playing fast and mean when they take on Appling. Ashby Cribb – The son of head coach Ken Cribb, Ashby is a do-it-all weapon on offense for the undefeated Jackets. A deep threat out wide and a solid wildcat quarterback, Cribb is at his most dangerous in the slot. Wayne Co. can kill you by a thousand cuts by just throwing quick pass after quick pass to Cribb. Having a guy like that on third down, in a huge situation, is priceless. 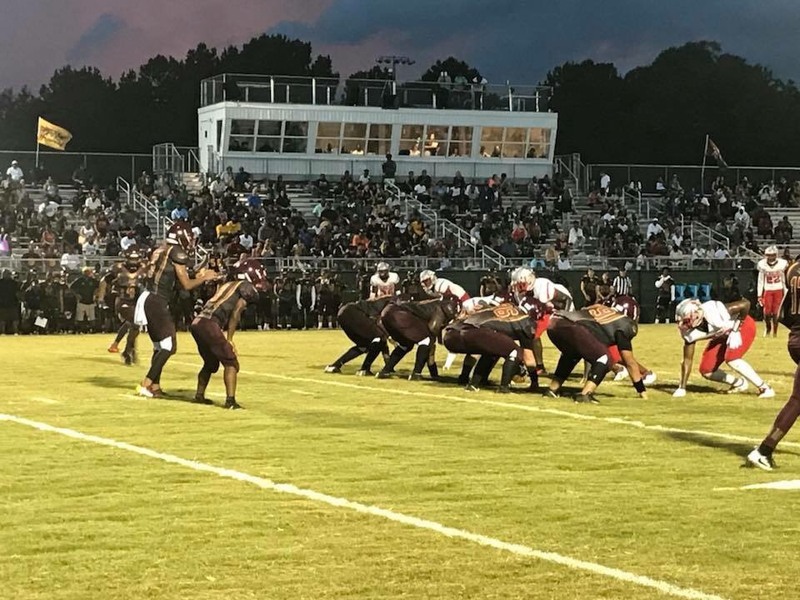 Dontre Wallace – The senior running back had to step up this year for New Hampstead, especially after the Phoenix graduated their starting quarterback and running back. Wallace has done a great job filling those shoes in 2018. The Phoenix might not have the record (4-5) that they wanted, but they’re in the playoffs, and that’s all that matters. Wallace is a load at running back, expect him to shoulder most of the touches for New Hampstead at Starr’s Mill. Logan Braucht – A staple in the Gator’s defense for the last 3 years, Braucht is one of the unquestioned leaders of a Ware County team with big aspirations. A Citadel commit, the senior made the switch from defensive end to linebacker at the beginning of the year and has excelled. As big as the tackles he makes are, his bigger role is making sure the entire defense is lined up correctly. He’ll have his leadership and skills tested against a very talented Riverdale team in round 1 of the playoffs. Marlon Taylor – Arguably the most underrated player in the state, Taylor is borderline unblockable from his defensive end position. He’s a big dude, at 6’2 270 lbs, and can play any technique across the line. The senior is a monster against the run, but he makes his hay as a pass rusher. If Glynn gets you in an obvious passing down… good luck. Taylor spearheads a very good Glynn Academy defense that will be leading this team into the playoffs. David Spaulding – Running back Kevin Harris is clearly where the Bradwell offense starts, but the Tigers have run into trouble when teams have been able to take him away. They need an another option that can take some defenders out of the box, and give Harris some room to operate. At 6’2 175, Spaulding could be that option. Naturally a corner, Spaulding has natural ball skills that translate well to receiver. Look to his last game, against Glynn Academy. Spaulding caught a touchdown and went up and “Moss-ed” Glynn defender on another reception. Spaulding could be the key to the Tigers advancing in the playoffs. Luke Carter – The senior quarterback for the Wildcats has had his ups and downs, like his team, all season. Carter is capable of making any throw the Wildcats need him to make, and will need to if Richmond Hill is going to make a run. Jerid Stokes – Another senior quarterback looking to take his team deep into the playoffs, Stokes is a prototype at quarterback. Big, tall, with a rocket for an arm, no part of the field is off limits for Stokes. Effingham is dangerous team that could make some noise in the playoffs. Jalen Davis – A senior linebacker for the Wildcats, Davis is an absolute stud on defense. Calvin Wilson of Explosive Recruiting said of Davis, “He’s a bad boy, man. He’ll come up and hit you in the mouth.”. Camden will need Davis, and the entire defense, to be ready to roll against an explosive Walton offense.